Young Sumit Nagal showed spark in his Davis Cup debut before a 'breathing problem' scuttled his victory march as India suffered a 5-0 whitewash at the hands of mighty Spain in the World Group Play-off tie, in New Delhi, on 18 September. Up against the reigning Olympic and French Open doubles champion Marc Lopez, who does not play singles anymore, the 19-year-old Nagal dominated the proceedings under muggy conditions before losing 3-6, 6-1, 3-6 in the dead fourth rubber, that lasted more than two hours. It was a mountainous task for Ramkumar Ramanathan to prevent a clean sweep since he had world number 13 David Ferrer as his opponent. The Spaniard cruised to a 6-2 6-2 win to complete a dominating 5-0 win for his side even as Ramkumar fought hard. The last time India suffered a whitewash was in 2003 against the Netherlands in the away World Group Play-off tie. It is the 21st time that India has been whitewash. 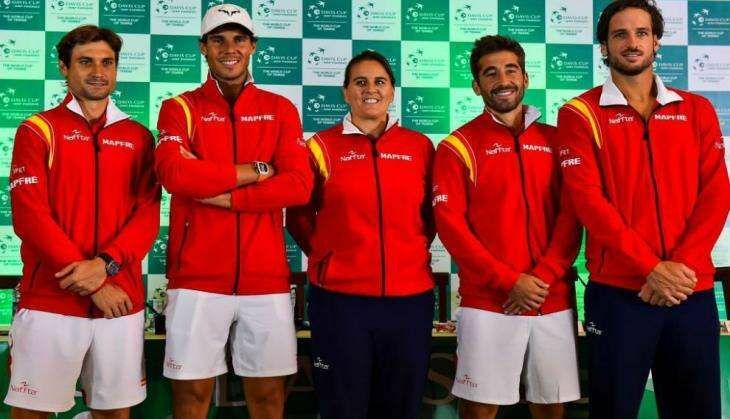 The tie already in the pocket of five-time Davis Cup champions, they chose to field Marc in place of Feliciano Lopez while India handed debut to Nagal. Lopez was playing only his second singles match in a Davis Cup tie. The last time he played a singles rubber was in 2013 World Group Play-off tie against Ukraine. Then also, he had played fourth rubber and won 6-3 6-3 against Denys Molchanov. The last time Lopez played a singles match on the Tour was in 2014 at Barcelona and that was only singles he played on the Tour that year. After overcoming initial nerves, Nagal opened up and played smartly. He packed a lot of power in his forehand and also used the drop shots smartly. He impressed with his style of play, court coverage and selection of shots. His backhand is still work in progress and Lopez attacked him there in the later part of the match. Had it not been for his breathing problem, Nagal was well on course for a memorable win, albeit against a player who is used to covering only the half-court in the recent years. Someone who is still finding feet in the ITF Futures circuit, the inspiring performance against world number 15 in the doubles will surely serve a huge confidence booster for the Delhi lad. Nagal received a medical time out for breathing issues in the second game of the third set after breaking Lopez in the first. This happened when the match was in his grip. He had saved three break chances before the trainer was called. He saved three more after receiving the treatment, held the serve and broke Lopez for one more time to take a 3-0 lead in the decisive set. However, momentum switched and he was not the player who was earlier dictating terms. Nagal lost five straight games after that to trail 3-5 and Lopez served out the match.